My husband and I took a weekend trip down the shore to Virginia Beach a couple of weekends ago. Our intention was to sit on our beachfront balconies and decompress, maybe eat some seafood (great crab cakes, ya know!) and hang out with some new friends. We did all that. But I also found time to hit a thrift store or two and even a garage sale. At the ONE garage sale I went to that Saturday afternoon, I was delighted to find a seller anxious to rid himself of everything. When I inquired about an old desk, he quoted $2 as the price. When I repeated the price back to him he immediately changed it to $1. Great. But I only had a $100 bill on me. “Load it,” he said. 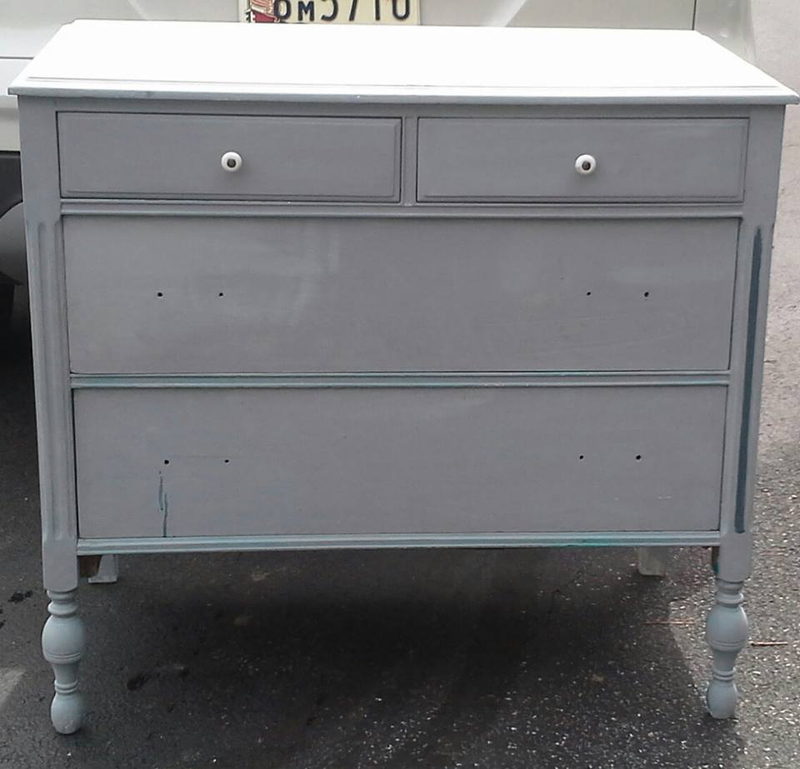 What I REALLY was interested in was a dresser that had seen better days, with an awkward paint color and missing handles (original or otherwise) and bib on the bottom (which is in one of the drawers). “What about this?” I asked. “Load it,” he replied. So they loaded both pieces into my rental van and off I went. Two free pieces of furniture. For me. A furniture hoarder, er, collector. What a great day. This piece was delivered to a furniture dealer in Washington, D.C. So I bring them home. I start researching. The desk is nondescript and needs a new front/hinged panel. I’m not sure what I’ll do with it/who I’ll pawn it off on. But the dresser! The first thing I noticed, as they were loading it up even, was that it had a label stapled to the back. 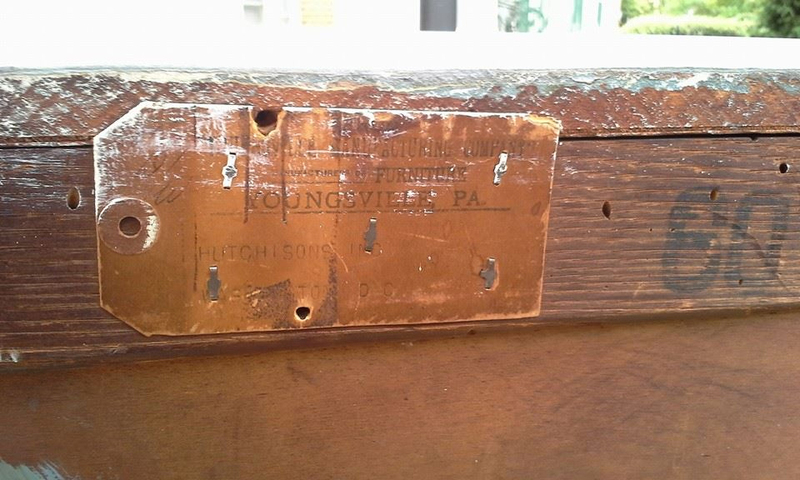 The label indicates that the piece originated at the Youngsville Manufacturing Company, Youngsville, PA. And it was delivered to Hutchison Inc. in Washington, D.C.
Youngsville Manufacturing Company has an interesting past, which includes incorporation in 1835. In 1896 they burned to the ground, and a new building started in 1898. In 1956, Youngsville Manufacturing was destroyed again. All I was able to find out about Hutchison Inc. is that they were located at 2004-06 Fourteenth St., N.W. in D.C. in 1945. So not much. What would you guess the age of this little gem to be? I am GUESSING that it is from the ’20s or ’30s. The legs say so but what do I know? I don’t know what color I’ll paint it or when I’ll even get to it. (I’m a hoarder, ya know.) But its future is bright. Very bright.